I wrote this story about Billy Kennedy on March 11, 2010. His Racers went on to beat Vanderbilt in the NCAA tournament a week later, 66-65. A year later, after winning a second straight Ohio Valley Conference title, he took the job at Texas A & M. And today he was named Southeastern Conference Coach of the Year. Respect and faith – that's Billy Kennedy's coaching philosophy in a nutshell. “I have a great deal of respect for the old coaches and the way they handled themselves,” Kennedy said. “Hank Iba, John Wooden, Pete Newell, and Dean Smith got it right. You prepare your team in practice and the games are like exams. “We practice to play and we let the players play the games. You shouldn't have to make a lot of adjustments during games if you do your job in practice. If you have good kids and they're playing hard for you there may still be times when you have to get on them. But if you have to do that very often then you aren't going to be very good. And underlying all of that is faith. Kennedy grew up in Metairie,La., a suburb of New Orleans. “I went to Holy Cross High School to play football,” he recalled. “That was my favorite sport at the time. I became interested in basketball because Holy Cross was a powerhouse. Don Maestri was the basketball coach there and he's the head coach at Troy State now. Kennedy earned all-district honors but by his own admission he wasn't a great player. “I was basically just a defensive player,” he said. “I could shoot a little bit, but I just played hard all the time. Coach Maestri left before I graduated and I ended up playing for Kevin Trower who took me under his wing and nurtured me. He married my mom so he's my stepdad now. “Coach Maestri had a big influence on my career. He's been the head coach at Troy State for 28 years. We're from the same neighborhood and we've remained close over the years. His passion and his love for basketball are what I admire the most. And he cared about people. After high school, Kennedy went to Southeast Louisiana as a preferred walk-on. He didn't get to play much so he transferred to Delgado Community College. After one year, a broken nose, and a broken wrist he decided to give up playing and focus on getting his degree. So he transferred back to Southeast. “While I was working on my degree I started coaching AAU and I refereed some,” he recalled. “I wanted to be like my stepfather because he had an interest in me and he was close with his players. I wanted to influence people the way he influenced me. So I decided to get into coaching. The staff at Southeast wanted Kennedy to help them get AAU players so they hired him as a student assistant. From there, Kennedy went to work for Benny Dees at the University of New Orleans. The Privateers made it to the NCAA tournament where they defeated Brigham Young. Dees left to become the head coach at Wyoming and Kennedy went with him. After a year at Wyoming coaching future NBA players Eric Leckner and Fennis Dembo, Kennedy took a job as an assistant at Northwestern State in Natchitoches, La. “It was my first full time job and I made $8,000 a year,” he recalled. “It was a tough life. I was married and I had a little boy. I rode a bicycle to work every day because we only had one car. From there I went to Tulane as the third assistant making $15,000 a year so I almost doubled my pay. My strength was recruiting. That's what people hired me for. In 1993 Todd Bozeman, who had been on the staff at Tulane, got the head job at California. One of his first moves was to hire Kennedy as his top assistant. “That was a breakthrough job for me,” Kennedy noted. “I was associate head coach at an early age and we had the #1 recruiting class in the country. We were in the top-10 for three years in a row so we had some really good teams. California hired Ben Braun away from Eastern Michigan to replace Bozeman and Kennedy worked under him for another year. Then he left to take the head coaching job at Centenary even though it meant taking a 50 percent pay cut. “Coach Braun wasn't comfortable with me being at Cal because a lot of people had wanted me to get the head job instead of him,” Kennedy explained. “And then I was trying to move my family back toward Louisiana. It was head coaching experience and it was really good for me. “At the time Centenary was the smallest Division I school in the country and they only won six games the year before I got there. I was 31 and Billy Donovan and I were the youngest head coaches in the nation. Kennedy took Centenary from six wins to 14 wins in just two seasons. And he rebuilt a moribund Southeast Louisiana, leading them to consecutive Southland Conference championships and a trip to the NCAA tournament in 2005. He was the National Association of Basketball Coaches District 8 Coach of the Year in 2004 and 2005. But after six years in Hammond, La. he left to take an assistant's job at the University of Miami (Fla.). After a single season in south Florida, Kennedy got the call that brought him to Murray. “I wasn't looking for a job but I got a call from Darren Boatright (MSU's former assistant athletic director) while I was on the road recruiting in Baton Rouge,” Kennedy recalled. “I knew Darren and he asked me if I would be interested in this job. I wasn't very familiar with Murray State other than I knew they had always been good. When he explained how committed the people here are to winning championships that impressed me. That's what attracted me. Kennedy had to scramble just a field a team in his first season. Only four players returned from the previous year. And of those four, one had a broken foot, two had played limited minutes, and the other had redshirted. 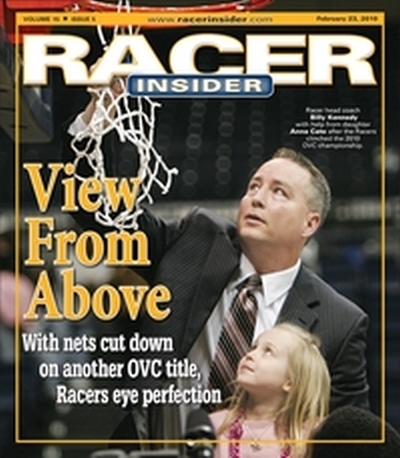 Even so, Kennedy held it together and led the Racers to a 16-14 record and second place finish in the Ohio Valley Conference. He followed that with two more second place finishes as he went about recruiting the kind of players he needed to run his system. This year, with all the pieces in place he led Murray State to a 30-4 record, a 17-1 conference mark, an OVC regular season championship, and an OVC Tournament championship. He was also named OVC and NABC District 19 Coach of the Year. “This team is what I envisioned from the start,” Kennedy said. “And for it to work out the way it has has been a blessing. We're playing defense the way I want to and offensively we're playing fast like I want to. We're doing it with good kids, we're doing it with depth, and we haven't had any injuries. Earlier I mentioned the importance of balance. This team is balanced in every way. “I'm thankful for the Nashville experience and the fan support we had there. People are passionate about basketball here. I want our fans to know how much I appreciate what they do. This was a special season. I'm hoping we can do it every year. We're going to try to, but you have to remember how many things went right for us this year.